The production of Kowa spotting scopes began in the early 1950’s and was officially used in the 1964 Tokyo Olympic Games. It was then discovered by birding enthusiasts and suddenly gained popularity that spread throughout the community of bird watchers and there is no looking back after that. The quality and reliability of Kowa spotting scopes are highly appreciated by users worldwide and the brand is a testament to more than half a century of experience, high end development and excellence recognized by millions of users around the world. CLICK HERE and check out Amazon for the Number 1 Kowa Spotting Scope, the TSN-773 Prominar, see the latest price PLUS any available DISCOUNT!!! 2 What Are The Various Kowa Spotting Scope Models? 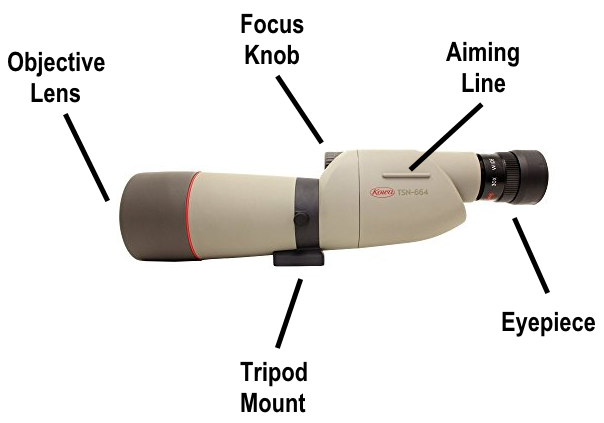 3 What Are The Features And Characteristics of The Different Kowa Spotting Scope Models? 4 Which Are The Top 5 Most Popular Kowa Spotting Scopes? 5 How Does Kowa Compare With Other Brands? In this article we will talk about the various spotting scope models from Kowa and layout the distinct features and specifications each of these models have. We will also give you the Top 5 models and review them to help you appreciate which one is more popular (not necessarily better) than the other. What Are The Various Kowa Spotting Scope Models? Each series have two models which differs only in body type (i.e., either Angled or Straight). There is also one model which is not part of any series, the TSN-82SV, which is of the angled-body type. So, all in all, you have nine (9) models to choose from. 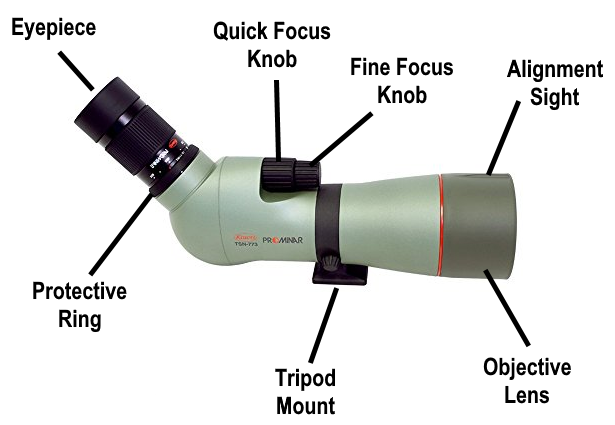 What Are The Features And Characteristics of The Different Kowa Spotting Scope Models? All Kowa spotting scopes are designed to be user-friendly, light and compact even with its large objective lens and they are all manufactured using the best available technologies. Details of each feature is elaborated on the following sections. 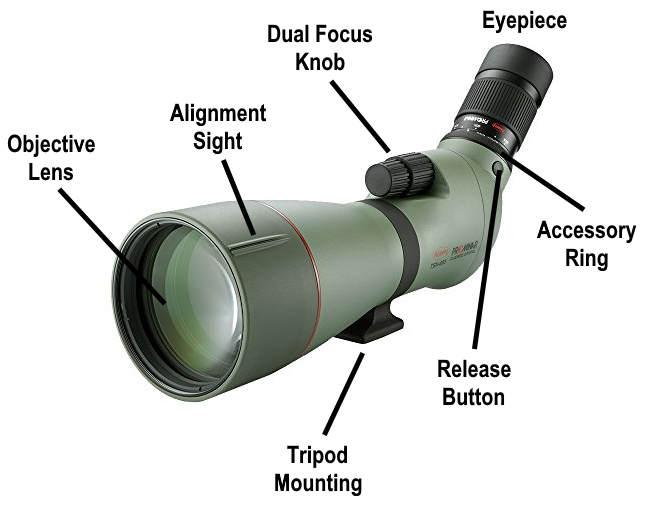 Kowa utilizes three (3) types of lenses depending on the model of the spotting scope but all of these lenses are of the Eco-Glass type (which is a type of glass that is environment-friendly, it does not contain lead or other harmful substances). Manufactured using Kowa’s advanced processing technology that was acquired over a lot of years, these fluorite crystal lenses provide users with the ultimate viewing experience. The FC lenses achieve optical characteristics that is unattainable with glass. For the real serious and dedicated users, this is the highest standard lens that you can have your hands on. Chromatic aberration is reduced considerably in this type of lens. Next to the FC lenses is Kowa’s XD lenses. The characteristics and performance of these lenses are close to fluorite crystal. Very clear eco-glass lens that is fitted in the 600 series and the 82SV spotting scopes. All Kowa spotting scope lenses, prisms, and dustproof glass are fully multicoated. This ensures sharp images and a clear visual range for your scope. Kowa’s proprietary KR coating process protects the lenses from dirt and other foreign residue that may affix to the lenses during normal use. Even in cases where the lens is accidentally touched, fingerprints or oil can easily be removed through proper lens cleaning methods. The magnesium alloy body of Kowa spotting scopes, which are made through a sophisticated thixotropic molding process, are built to endure all types of adverse environmental conditions. It has the feel and strength of a traditional metal body but with decreased weight when compared to other large-diameter scopes. They are also designed and shaped ergonomically for easy handling and use. All the high-end models (770 & 880 series) of Kowa spotting scopes come with a dual focus system which makes focusing really easy. The quick focus has the larger yet easy to turn knob. It will focus from infinity to 5m in two (2) revolutions. The fine focus, the smaller knob, has a smoother movement and pinpoint accuracy. It is extremely useful at high magnifications and for digiscoping systems. This is a standard feature with Kowa’s eyepiece bayonet mount which is used in these spotting scopes. The locking mechanism is provided to keep the eyepiece in position and prevent it from getting lost or falling out unexpectedly. An insert to the tripod mount of the scope is provided to allow the scope to be secured to both ¼ and 3/8 inch mount tripods. The housing is made waterproof in accordance to JIS Protection Class 7. The inside of the scope is purged with air and filled with dry nitrogen gas to prevent the lenses from fogging. With all these excellent features, you would see that Kowa’s scopes are designed and built for users so that they can enjoy more of what nature has to offer. Which Are The Top 5 Most Popular Kowa Spotting Scopes? In 5th place is the TSN-82SV. It has an 82mm objective lens with outstanding light gathering power and a very bright field of view. The main body length of this scope is 383mm (or 15.1 inches) with a weight of 1490 grams (52.5 ounces). The image below shows the scope’s basic parts. The eyepiece mount is of the “bayonet” type which allows the eyepiece to be easily attached and removed. The focus knob allows a smooth and accurate focusing. Turn the knob clockwise for distant focusing and counter-clockwise for close focus. The minimum focusing distance of this scope is six (6) meters or twenty (20) feet. The objective lens has a “sliding sunshade” feature that you can use to protect the lens from exposure to rain or to keep direct sunlight from entering the scope. There will be times that an object is difficult to find. 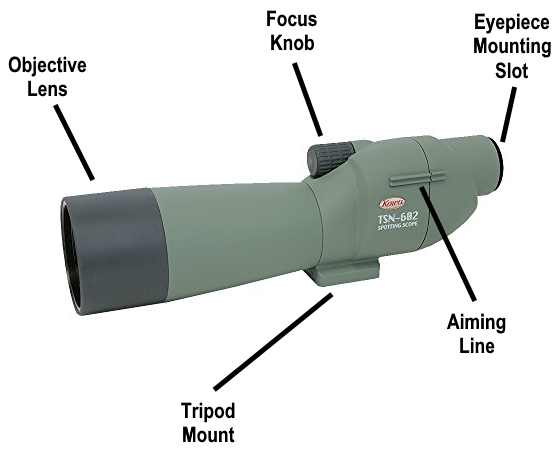 In these instances, you can use the sighting tube mounted on the side of the scope to aid you in viewing these objects. The tripod mount makes it easy to fix this scope onto a tripod – which makes sense utilizing if you’re going to use it for a long time. Note also that the tripod mount can be rotated to allow the scope to be set at various angles by loosening the lock screw provided. The 82SV has been in production for more than 20 years and improvements in glass lenses and coating procedures were incorporated in this scope through the years giving you spectacular views and images. Users are also very happy with this scope so you’ll be rest assured that the 82SV will give you a great performance in the field. The TSN-602 model is occupying our 4th place. It is a high-performing scope in a straight, lightweight body which makes it very easy to carry and handle in the field. The 602 has a 60mm objective lens with fully multi-coated optics so images are really clear and crisp with this scope. The main body length is 298mm (11.7 inches) with a main body weight of 720 grams (25.4 ounces). The objective lens has a sliding hood (sunshade) to prevent unnecessary light and raindrops. The focus knob operation is similar with the 82SV, clockwise for farther focus and counter-clockwise for close focus. The aiming line is helpful for quick sighting when you are using high magnification or when the subject is pretty small and hard to see. The eyepiece slot is also of the bayonet type to ensure easy and quick replacement. Note that the product being reviewed here has no eyepiece so you have to buy it separately. High quality spotting scope with a lightweight design makes the TSN-602 a very good companion for hunting and digiscoping. Price is really cheap as well which makes it really a great deal! In 3rd place is the TSN-883 Prominar, one of Kowa’s supreme models. It features pure Fluorite crystal lenses for optimum optical material which reduces chromatic aberration, providing you with the ultimate viewing experience. The 883 model has a main body length of 343mm (13.5 inches) and a main body weight of 1,520 grams (53.6 ounces). The magnesium alloy body is made from a sophisticated molding process called thixotrophic molding which has the feel and strength of a traditional metal body with decreased weight when compared to other large-diameter scopes. With its ruggedly structured body, it can tolerate the severest conditions and provides confidence and a sense of security for the user. The objective lens has a built-in alignment sight that you can use to view difficult to find objects. Same as the other models, it also has a sliding hood feature to protect the lens from rain and direct sunlight. The 883 also features a dual focus mechanism (Quick and fine focusing). The quick focus, with a large and easy to turn knob, will focus from infinity to five meters in two revolutions while the fine focus, with smooth movements and pinpoint accuracy, is extremely useful at high magnifications and for digiscoping systems. The eyepiece is of the standard bayonet mount but it has a locking mechanism to prevent the eyepiece from getting lost or falling out inadvertently. The release button is pressed when removing the eyepiece. It is important not to remove the eyepiece without pressing the release button as it can cause damage to both the spotting scope and eyepiece. A protective accessory ring that is attached to the accessory mount is also provided. This protective ring must be removed before attaching any accessory. Note that you can only remove this ring when an eyepiece is not attached to the scope. The TSN-883 is a really great, high-end spotting scope that is built with Kowa’s top-of-the-line optical technologies. Compare to other brands that offer you the same quality at a higher price, the Kowa TSN-883 Prominar is indeed an amazing product at a highly competitive price. In 2nd place is the TSN-664M spotting scope. It has a 66mm objective lens which has 120% more light gathering capability than a 60mm scope ensuring a bright field of view during observation. It is a high-performance spotting scope with a rugged construction, high-end specifications, and Prominar ED lenses that makes it perfect for bird watchers, hunters, and target shooters. The main body length of the 664M is 311 mm (12.2 inches) while its body weight is only 1,020 grams (36 ounces). It is constructed from a strong, lightweight polycarbonate materials, with a rigid structure which makes it very durable. It is also ergonomically shaped and has a rubberized coating and with its compact and lightweight design, it is very easy to carry and handle. 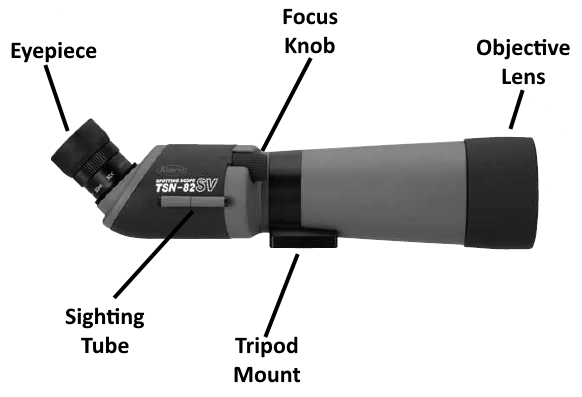 The objective lens with a sliding hood, the rotating tripod mount, bayonet eyepiece mount, dust protection glass and accessory mount protective ring are all features similar to other models. Unlike the 770/880 series, there’s only one focusing knob for the 664 which functions similarly to the 600’s & 82SV’s. The aiming line of this scope is located on the left side of the body near the eyepiece end. The filter threads in front of the objective lens allow various types of 72mm filters to be attached to the spotting scope. The TSN-664M is a very powerful scope that gives you image quality and great performance in the field that is comparable to other high-end brands such as Leica or Swarovski but at half the price. You are doing yourself a huge favor if you choose this scope over other brands as you are getting the same (if not better) quality at a much more affordable price. And as of this writing, the most popular of the Kowa spotting scope models, in 1st place is the TSN-773 Prominar angled body scope. The 773 has a 77mm objective lens with a main body length of 318mm (12.52 inches) and a main body weight of 1,330 grams (46.9 ounces) which is about 200 grams less than the 880 series. This model uses an XD objective lens that has low dispersion properties and is comparable to fluorite crystal lens found in the 880 scopes. That is why there is no noticeable chromatic aberration with the 773’s. The model 773 is provided with dual focus knobs, the larger one is for quick focus while the other is for fine focus. The fine focus has smoother movements compare to the quick focus. A locking mechanism is also provided for the eyepiece as a safety feature to prevent you from losing your eyepiece unexpectedly. Similar to the other models, the body design structure and ergonomics features of the 773 are a result of Kowa’s high-end technology and many years of experience with optics. The TSN-773 Prominar is one of Kowa’s top end models and as far as users are concerned, the quality of this spotting scope is incredible, no wonder why it is the most popular model out of Kowa’s spotting scope series! How Does Kowa Compare With Other Brands? If you are going to compare Kowa spotting scopes vs Swarovski, or vs Zeiss and other high-end brands, you will be surprised that the image quality of Kowa is the same if not better, especially with Kowa’s Flourite Crystal lenses. The performance that you’ll get from Kowa is very remarkable that choosing another just for the sake of the brand would not make sense at all. Because with Kowa, you’ll get two things: great performance and competitive price – so you won’t need to drain your wallet! Some users that used to have other scopes before also say that images seen from Kowa’s lenses are better than other well-known brands such as Leupold, Nightforce, Nikon or Vortex that is why they enjoy their hobbies now more than ever with Kowa spotting scopes. With its high-quality design and rugged construction featuring high-end optics, you will be amazed with the quality of images from Kowa’s spotting scopes. Their scopes are logically tailored to meet the needs of the most demanding user so you’ll get to enjoy using it in the field. Users of these advanced spotting scopes will know that they own an extremely high quality equipment. In fact, people who bought and used them are one in saying that Kowa scopes are indeed superb and will give those high-end brand a run for their money! Experience the Kowa difference today! Check out the most popular of the Kowa spotting scope models, the TSN-773, by clicking the link below. Steiner Binoculars – High Quality Optics From A Reliable and Trusted Brand!